As 2016 draws to a close, I want to thank all of my blogging buddies, Tweeters, Instagramers, Facebookers and Googly people for being part of my world this past year. In case you don’t know, you all rock! Although my daily and main priorities lie in family, friends, faith and that lovely hobby called work, the online world has been a source of comfort, hysterical humor, important information about trains and such, beautiful photographs and the development of a few important friendships. I am grateful for everything in life, no matter the ups and downs or the good and bad of human existence. I am thankful that I have a home with a Christmas tree that family and friends will surround. I am blessed that I get to spend another holiday with my mom. I am ecstatic that I don’t have to go back to work until January 3rd. I’m happy that I may have free time to spend some of my vacation with YOU. I hope everyone who reads his has a peaceful, calm, fun, loving, smile-inducing and blessed holiday. Enjoy your traditions and however you spend the next two days. Thank you again and Merry Christmas from MJM and the furry kids. Thanks. To you as well. 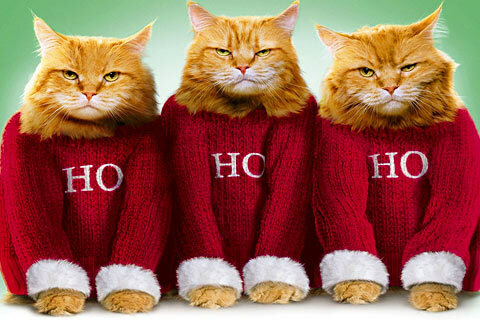 Those are the triplets that were born after Grumpy Cat, by another mother. Merry Christmas to you, Mary. And of course the ever lovely Ziva and Lord Gibbs. The kids with you a Meowy Christmas and a Purrect New Year. No worries, H. When you get done organizing your life, I’ll be expecting some tips and/or instruction. It’s snowing as I type this. The good thing is that it’s not too cold out, so this is a pretty snow. Happy Christmas to you and yours! It’s “warm” in winter terms, Herman. It’s snowing now, but we’re supposed to have a high on Sunday of 40F and rain. That’s going to make a mess of things. Gibbs and Ziva say “meow” back! Dear Mary, Even though you may not see it, I think of you, Gibbs, and Ziva always! I am so happy Mom is with you to celebrate Christmas. I truly hope the coming year always us to see each other. Wishing you the Merriest of Christmas’! Please give Mom a gentle hug from me. Love you, Mary! Oh, Judy, I think of you too and I keep hoping there will be a reason for us to get together again. I need to give you a not-so-gentle hug. I hope all is well with you, Raymond, Willow and Autumn. Merry Christmas! The thanks praise definitely flow in both directions, Mary. You have brought humor, joy, sadness, and thought-provoking content to us throughout the year. You have been a good friend and a bright spot on many days that were otherwise lacking one, and you have introduced me to some wonderful connections. MiMi and MuMu also appreciate the wise counsel of Gibbs and Ziva. I look forward to another year of fun and meaningful reading. Merry Christmas, Happy New Year and Go Pack (up to a point). Awwww…Dan, thanks for the kind praise. I’m glad that our blogging paths crossed (how many years ago?) and that you’re one of the bloggers I call friend. Gibbs and Ziva are wise counsel? Really? I thought they were just full of….shi…salmon. Oh well, I supposed I should let MiMi and MuMu believe. Have a wonderful holiday and Go Steelers (yeah, to a point). Personally I gotta say that another piksher of Gibbs and the Queen would’ve been better. I’ll work on that, M-R. They might pose for extra kibble. Thanks Joey. Have a wonderful holiday weekend! Oh wow the 3rd of January’s like ages away, good for you, Mary. May you and your mom, family and friends have a wonderful Christmas too. Thanks Phil. I want this time to pass slowly so I can really enjoy. Happy holidays! Your kitties better watch out, Santa looks like he has a Darth Vader strut going here!! Ha! The way Gibbs behaved Christmas Eve night, I was ready to call up the storm troopers. With Christmas Day behind us, the real relaxing and enjoying of the holidays can begin. … and Santa did not bring me a new bike. What’s up with that?! pfft. I have through Friday to spend time with myself, to do whatever. First up: Catch up on sleep! What a lovely, heartfelt post. We do all need to be grateful for the blessings in our lives and you set a great example. Enjoy your next days off from work, and happy new year to you, and your human and animal family. Happy 2017, Laurie! I hope it’s your best year ever and that life is exceptional. Enjoy the ride! Hello! I’ve been reading your site for some time now and finally got the bravery to go ahead and give you a shout out from Huffman Tx!